I’ve been shopping at the Tucson gem shows for 4 years. Four trips means I’ve seen a lot, and as I embarked on my trip in February and started thinking about which venues I wanted to visit, I realized I had become a little bored with going to the same venues I’d come to depend on as the biggest and most likely to yield the best goods. WHAT? Can I possibly be saying that with over 3,000 vendors to choose from, I’ve seen it all? No, that’s not what I mean. It’s just that some of the wonder and awe had worn off a little and I began to approach shopping differently now. The first time I went, I didn’t know what to expect and everywhere I looked there was something new, so it really didn’t matter where I went. I tended to choose venues where it looked like it was easy to park. Some were wonderful, some not so much. So, with 50+ venues to choose from, and only 4 shopping days, how did I go about choosing which to visit? I have several goals in choosing venues now. The first is to visit the people I already know. This is one of the key reasons I love to go. I love making that personal connection, building the relationships with vendors that will last through the life of the shop. Throughout the year we may talk on the phone, or just connect via email, but meeting face to face, and sometimes even sharing a drink or a meal, improves that connection. It’s one of the things that makes having the shop so darn much fun. It also allows me to see and share the genuine excitement that these vendors have for their products. Another goal each year is to visit a venue I haven’t visited before, no matter how difficult it is to get there, how obscure the location, or what I expect (or don’t expect) to find there. I went to one this year that had about 10 vendors total in it. Pretty small by Tucson standards. But I found some awesome and interesting things. Beautiful copper pieces I can incorporate into metal clay projects (Yes – I do shop for myself, not just the bead shop! ), slabs and chunks of rock I can cut into shiny cabochons (so what if I don’t even know how yet! ), and some of the most beautiful rhodochrosite I’ve ever seen. This was a quiet little venue, but as I talked with the woman selling the rhodochrosite, I learned that I have purchased from her before at a booth her husband operates at much larger venue. This particular location was actually a small storefront in front of their permanent warehouse, where they staged their product for their travels to wholesale shows throughout the year. I was the only one with her for a while; we had a nice conversation, and she gave me directions on how to walk through an alley and under the highway over to several other venues I might like. What a truly interesting find! At that little venue, I developed my third goal for shopping in Tucson which is that it’s not always about finding the next great bead. I learned that sometimes it’s valuable to just relax and look and gather inspiration from all that is there to see. I saw many folks spooning fresh coconuts for lunch in the African village venue, I sipped a soy smoothie from a stand whose proprietor was from London and just came to Tucson to set up her organic snack bar at the show, and I saw geodes filled with sparkling amethyst taller than me! I learned a whole new way of window shopping that lets me relax and enjoy the experience and lets my imagination soar. I pull out my little notebook from my purse and jot ideas for projects, designs, and classes. I record information about oddities and maybe even names of vendors I’d like to remember for future visits. So, if you ever travel to the Tucson gem shows, don’t sweat about which venues you go to. There is something incredibly wonderful to discover at each and every one of them. And if you don’t go, every year I will continue to bring a little of that magic back to Maryville for you to share the experience. 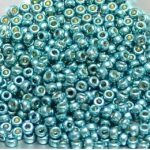 Thanks for reading – now go bead something!